A collective academic research book has recently been published by Prof. H. Håkansson and I. Snehota, members of the IMP – International Marketing and Purchasing research group, linking researchers across Europe working since 40 years on the topic of business relationships. 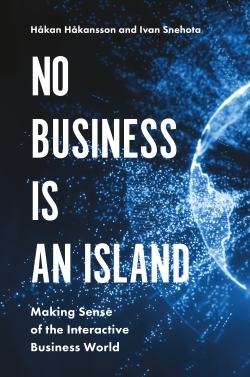 « No Business is an Island: Making Sense of the Interactive Business World » is the summary of their work. In the objective of better describing and understanding the economy, classically presenting a business as an isolated, independent, rational, well informed actor, it presents « the World of Business as a Rain Forest« , defined by « continuity of inter-organizational business relationships, diffused interdependences that confer the business world characteristic of a network structure and the ubiquity of interaction processes within and across companies » where « products are a variable defined by the parties » and « every company stands out as a unique node at the intersection of a specific set of business relationships » and « interaction takes place between active and incomplete/unsatisfied actors, all with their limitations in terms of resources and capabilities« . Obviously, we are facing here another form of systemic view of the economy, the businesses, their structure and products/services. The importance of management in developing and maintaining the business relationships of companies : the middle- management positions –purchasing managers, sales managers and technical managers- are fundamental for the development of business relationships. It is these managers who actually create or generate value in business relationships, and this creation of value is central for all companies. Managers’ ability to motivate their counterparts in business relationships is a central aspect of relationship development. Our regular readers already know how close this is to what is developed in this blog : for Purchasing as well as the whole company. Implications for Research also point out « the shortage of available conceptual tools to approach the phenomena that are relatively easy to identify and observe but for which we have few analytical concepts. … Interdependencies need to be considered in theorising the highly complex and multidimensional interactive business world. ». A systemic approach and modelling and Value(s) methods sure could help ! A definite Purchasing -and other- managers must read !